A "use-it-or-lose it" system of water allocation has historically required growers in California to irrigate their land or lose their water rights, whether market forces compelled them to grow crops or not. 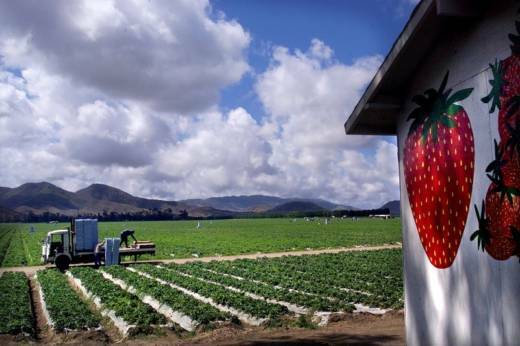 Now, in a significant breakthrough for the state’s water economy, a community of farmers near Ventura are about to join a new groundwater market. The buying and trading system, expected to begin by July 1, will allow farmers under the purview of the Fox Canyon Groundwater Management Agency to fallow their own land and sell groundwater to other users willing to pay more than their crop sales would generate. This small-scale water market has been in planning stages for more than a year and is being launched as a pilot project that could eventually serve as a model for the rest of California. Matthew Fienup, executive director of the California Lutheran University’s Center for Economic Research and Forecasting, has worked with the Fox Canyon agency, local growers and the Nature Conservancyto help design and launch the program. He said the new system creates a powerful incentive for the region’s growers, who produce strawberries, lemons, celery and avocados, among other crops, to conserve water. “If all you’re allowed to do with your water is turn it into an agricultural product, there is an incentive to use all of it, and you end up with a race to the bottom of the aquifer,” Fienup said. The new groundwater market not only limits each farmer to a specific water allocation but may actually reward them for not using it and instead allowing another grower to buy it. The market comes at the same time that California is working to implement the Sustainable Groundwater Management Act. That law, passed in 2014, requires that Groundwater Sustainability Plans be created to curb the overdrafting of aquifers. In the Fox Canyon area, where some groundwater basins are considered critically overdrafted, the regulations could eventually result in 40 percent reductions in pumping allowances, according to E.J. Remson, a Ventura-based senior program manager for the Nature Conservancy. Such cuts could mean scaled-back farm production and reduced revenue – and that’s where the market will come in. It will allow for quick and easy transactions that will offer farmers the chance to sell one asset – water – if growing another one – fruits and vegetables – doesn’t pencil out. In fact, the Sustainable Groundwater Management Act could potentially put growers in some areas out of business by imposing “existential financial stress” upon them, Fienup said. The wide range of crops grown in California makes it a prime place for successful water markets, explained Ellen Hanak, director of the Public Policy Institute of California’s Water Policy Center. That, she said, is because farmers who are growing a crop of relatively low value “would be paid handsomely” for their water as growers with more valuable crops – like, say, avocados or almonds – purchase the right to pump more water. “Everyone is better off in the end,” the PPIC’s Hanak said. She added that in regions like the Midwest, with sprawling grain monocultures, the economic playing field is too level to drive movement of water from one grower to another. Under such conditions, water trading systems are less serviceable. Water trading is nothing new for California – farmers in the state have long traded surface water allocations in transactions that allow for water to be delivered over long distances, often from areas of plentiful supply to those with severely impacted supplies. Although these trades may be very profitable for the parties involved, they are associated with a problematic scheme whereby the seller uses groundwater to replace the water he or she sells – a system of so-called groundwater transfers that ultimately increases the net volume of water being used. The Sustainable Groundwater Management Act will make these transfers more difficult to conduct, if not illegal, while encouraging groundwater trading within basins. Water is also purchased for environmental uses. According to research by the PPIC, more than 5 million acre-feet of California water was acquired via trading from 1982 to 2014 to support environmental needs, including replenishing depleted wetlands and rivers. As of mid-June, 86 wells were registered under the new Fox Canyon groundwater market, with each well newly fitted with electronic meters to prevent farmers from pumping more than they are allowed. The growers in the affected basins use about 62,000 acre-feet of water, with individual allocations based on historical use, according to Remson. This environmental organization has been closely involved in developing the new water market. Last week, Remson personally assisted farmers who were installing their electronic well meters. He said the Nature Conservancy has a vested interest in helping farmers stay in business, since that will ensure their land is not converted into suburban developments. “We’ve spent a lot of money and time trying to save and restore the Santa Clara River, which runs across the Fox Canyon area,” he said. He noted that permeable agricultural land allows rainfall and runoff to seep into the earth, where it helps maintain waterways and marshes. Asphalt surfaces, on the other hand, prevent water from entering the ground and divert it elsewhere. Fienup said the tamper-proof well meters, which electronically record and aggregate pumping data, will be essential to sustaining an effective water market free of unscrupulous overpumping. In addition, at least two other elements are critical, he said – grower participation in designing the trading system and stiff regulatory oversight. “There needs to be enough regulatory pressure that farmers take seriously the prospect that cuts [to their allocations] are coming,” he said. In other words, if farmers believe that their own use of groundwater will never, in fact, be curtailed, they will have no need to buy water from neighbors. Such enforcement of the laws created by the Groundwater Sustainability Plans required by the Sustainable Groundwater Management Act will come directly from local authorities. State officials, Fienup said, will theoretically provide close oversight, and mandatory usage cuts, he added, will be imposed over the next 20 years. “As that happens, trading will increase,” he said. Hanak expects regions with severe groundwater deficits to launch their own groundwater markets in the near future. She sees the southern San Joaquin Valley, the Central Coast region and the area around Paso Robles as likely candidates for groundwater markets modeled, at least loosely, on that of the Fox Canyon area. Even areas where aquifers are robust but which have impacted surface water resources – like the Russian River basin – could benefit from water markets to even out imbalances in distribution. While the Sustainable Groundwater Management Act will probably eventually reduce California’s total irrigated acreage, Hanak said benefits will outweigh the sacrifices. “Groundwater markets make water flow toward the most valuable uses, which is good for everyone,” she said.